One of the most difficult transitions food-wise when I emigrated from my native U.S. to England was the sudden lack of tolerable Latin American food. Therefore when I started hearing rumours of Mestizo’s not advertised vegan menu I had a calling to drag my arse up to London for dinner (as a point of reference taking Mexican food away from an American is akin to taking curry away from a Brit- it’s harsh and causes almost hallucinogenic cravings). A short walk from Euston Square tube, it’s a classy (and seemingly popular) spot; we weren’t expecting to need reservations on a week night, but thankfully the staff were able to find us a table after a short wait. The food was spot on (I can’t stop thinking about it) and the portions were generous. In fact I think two or 3 starters would make a fine main if any of the three vegan main options don’t strike your fancy. Be sure to ask for the vegan menu as it’s not included on the primary menu. Panuchos: Two corn pastries topped with refried beans and marinated onion (£6.80). I’m sorry, but corn tortillas beat their flour-based cousin’s arse in almost every way (save the godsend comfort food that is the burrito). 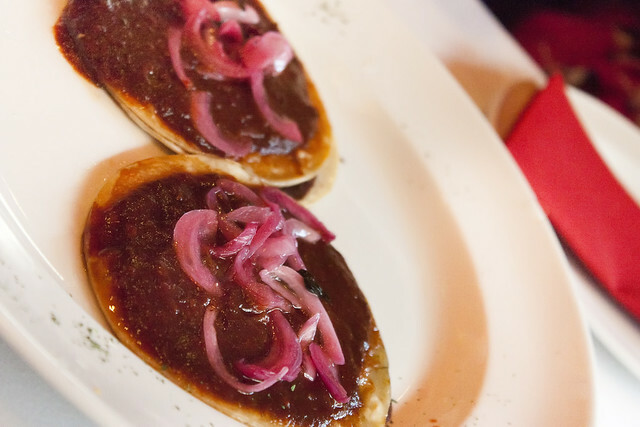 Stuffed and smothered with refried black beans and sauce, topped with pickled red onions, they take tostadas up about a million levels. I can’t wait to try making my own version! 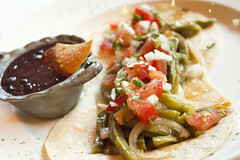 Taco Nopales: Two corn tortillas topped with tender cactus leaf and tomato, cilantro, onion, and japaneño chiles (£4.80). Again with the tortillas. Admittedly this was my first taste of cactus, and I’ve got to say I’m a fan. I can only imagine if I ever tried it fresh from the source I’d praise it yet higher. Not at all spicy, not a chile in sight, these colorful little wraps come with a side of basic black bean sauce. I tried my best to be as British as possible, so ate them with a knife and fork (for real, this is the only country in the world where you might see people consume even burgers with cutlery). 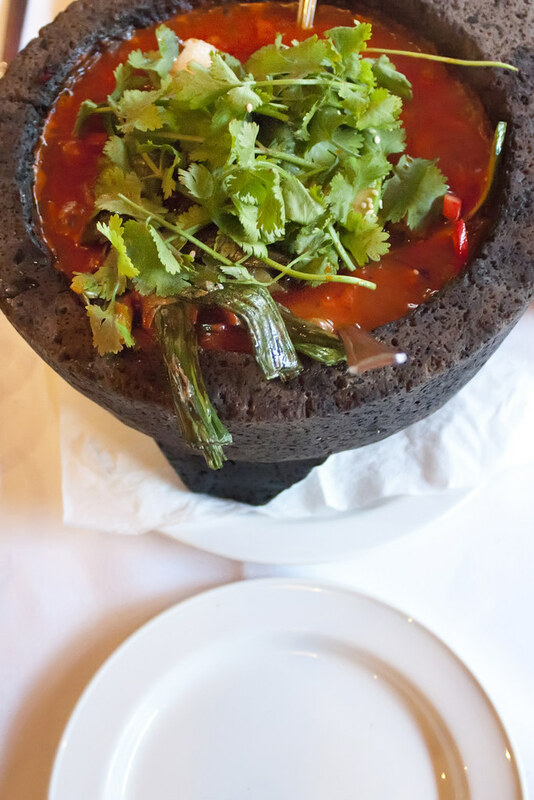 Vegan Molcajete: …mixed grilled vegetables, spring onions, cilantro and avocado and your choice of salsa roja, tomatillo, mole or chipotle (£19.40 for two). The molcajete is Mexico’s answer to the pestle and mortar, a stone recepticle for grinding foods and preparing condiments. Additionally, as in Mestizo, the container can be used as cookware for stews. At £9.80 per person for a minimum of two servings (including a stack of warm flour tortillas- they offered us more when we ran out), this bubbling pot could easily feed a third starving dining companion. We ordered the chipotle version and while it was spicy, it wasn’t over the top (in fact it was about the perfect level of spice for me). You might need a glass or ten of something cold to wash away the heat, but that’s not necessarily a bad thing. Inside the pot was a selection of cactus leaf, avocado, and a variety of other vegetables (including a gigantic submerged and uncuttable spring onion), topped with a stack of fresh coriander. I think I probably say this every time I enjoy a meal, with good reason because it’s true, but I’ve been craving this every day since I had it. All American expats in London should already be on the phone booking a table, but if not then I implore you to consider Mestizo sometime soon. If you like Latin flavours you’ll love this London gem. My only complaints involve a sometimes over-eager table service, a bit too speedy on the dish takeaway without first checking if you’re finished (though this did improve with the main course). I’d also like to see jugs of water on the table as opposed to tiny water glasses (it would save staff time and effort running around to give refills all the time). Finally I hope Mestizo will both add the vegan menu to its website and remove honey from one of its listed vegan salads (maybe they have- I didn’t enquire). 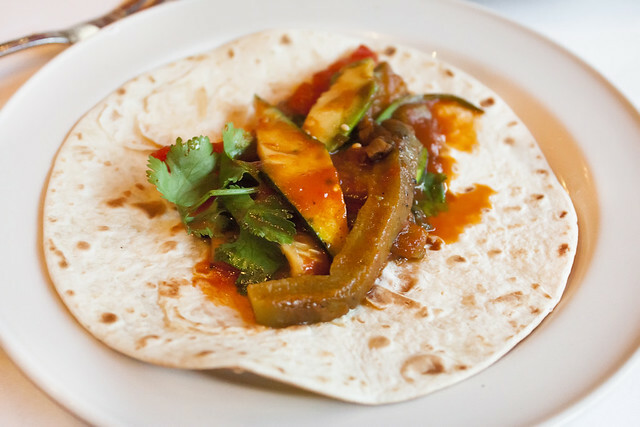 It’s not a restaurant vegans are talking about and it should be, but without making the menu public the so-called London vegan Mexican menu remains to many more of a rumour than an absolute fact. If you agree then please consider contacting them to request they add the vegan menu to their website. The food itself was absolutely flawless. I can’t wait to go back. Yes! I was telling Els about this the other day too. It’s one of my favourite restaurants in London.